For use where power is not available. Recommended for clean multi-wire fence. 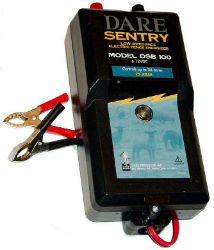 External 12 volt battery- Great output for your money spent. Recommended use for cattle/cows, horses, pigs, dogs and garden animals. Controls up to 25 acres of clean fence. Outperforms 10 mile energizers.